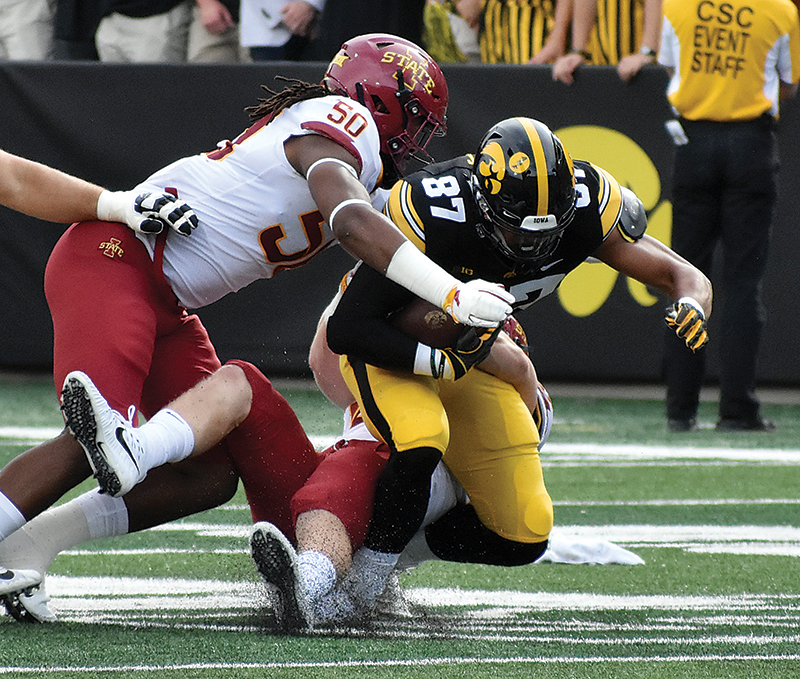 T-R FILE PHOTO - Iowa State redshirt sophomore defensive end Eyioma Uwazurike (50) and freshman linebacker Mike Rose, behind, bring down Iowa tight end Noah Fant (87) during their football game on Sept. 8, 2018, at Kinnick Stadium in Iowa City. AMES — Iowa State’s defense has quietly been among the nation’s best over the past two seasons. The Cyclones might be better than ever this year. Despite losing defensive backs Brian Peavy and D’Andre Payne and linebacker Willie Harvey, Iowa State (8-5 in 2018) has a chance to field one of the top defense in school history next fall. The Cyclones return 11 players with starting experience and five who’ve earned all-league recognition to a unit the led the Big 12 in scoring defense (22.9 points a game) a year ago. Iowa State, which opens on August 31 against Northern Iowa, wraps up spring practice next week. The biggest holes the Cyclones will need to fill are in the back end, where Peavy and Payne starred for years. But Iowa State does bring back safety Greg Eisworth, the Big 12 Newcomer of the Year in 2018, and Braxton Lewis and Lawrence White are also expected to see significant snaps at safety. 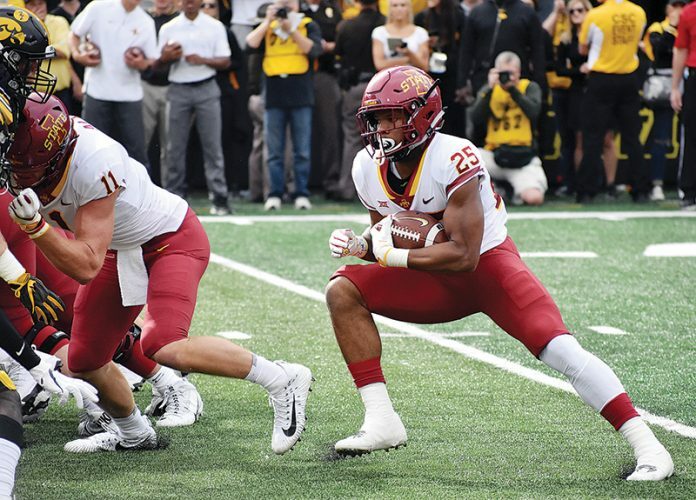 Iowa State also hopes it has found long-term answers to Peavy and Payne’s departures in sophomore cornerbacks Datrone Young and Anthony Johnson — both of whom cracked the starting lineup at different times a year ago. Freshman Tayvonn Kyle and sophomore Keontae Jones also could be counted on for snaps on the outside. On the other side of the ball, last season’s emergence of quarterback Brock Purdy pushed sophomore freshman Re-Al Mitchell into a tough spot. Purdy threw 16 touchdown passes and broke the NCAA record for passing efficiency for a true freshman, and barring an injury he’ll be the starter next season and beyond. 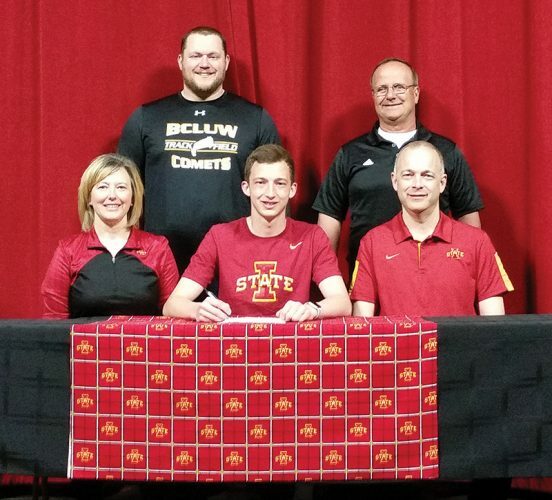 Mitchell chose to stick around though, and the Cyclones are glad he did. Mitchell will likely serve as Purdy’s backup next season ahead of graduate transfer John Kolar, who barely played in four years at Oklahoma State, and freshman early enrollee Easton Dean.